Comments after February 18 meeting between the separatist leaders of Abkhazia and South Ossetia and Russian officials gave no indication Moscow will recognize either breakaway region soon, with the de facto presidents speaking of a “step-by-step” quest for independence. Meanwhile, top Georgian government officials reaffirmed yesterday they have no plans to consider recognizing Kosovo, although stopped short of condemning its declaration of independence. After meeting with Russian parliamentary speaker Boris Gryzlov in Moscow, de facto president of South Ossetia Eduard Kokoity appeared to downplay the possibility of imminent Russian recognition. Before the meeting de facto authorities said they will submit a formal request for recognition to Moscow by the end of February. However, during the meeting Gryzlov said only that Moscow should “reshape its relations with self-proclaimed republics” in the former Soviet Union. 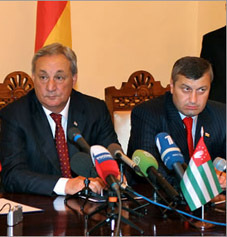 De facto president of Abkhazia Sergey Bagapsh suggested this could mean lifting the economic embargo that the Commonwealth of Independent States wields on Abkhazia, according to Interfax. Russia has long been accused of covertly supplying Abkhazia with financial and military assistance, despite the embargo. Meanwhile, Tbilisi appears to be opting for an uneasy balance between recognition of Kosovo and condemnation of the independence declaration. Foreign Minister Davit Bakradze reaffirmed previous statements by top government officials that “Georgia does not plan to consider issue of recognition of Kosovo’s independence,” according to online news source civil.ge. Russia, China and a number of EU states including Spain have all warned of the possible impact of Kosovo independence on other secessionist regions. Russian Foreign Minister Sergey Lavrov told Washington of its concern over the Kosovo issue in a telephone call with US Secretary of State Condoleeza Rice, the Russian Foreign Ministry announced in a statement yesterday. “The danger was emphasized of the consequences the move is likely to have for world order and international stability that took decades to build,” the statement reads.